The PACT system can be used to treat industrial, refinery, petrochemical, coal gasification wastewater, as well as highly contaminated surface water or groundwater. 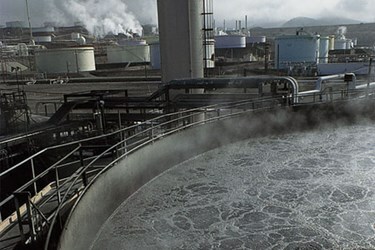 The single-step treatment process results in significant cost and performance advantages over systems such as activated sludge and granular carbon. There are many other benefits to using a PACT® system. The powdered activated carbon used in the systems improves the performance of biological systems by stabilizing them against upsets and shock loading. PACT® systems control color and odor, and can reduce costs for residuals disposal and remove soluble organics. With a PACT® system, you will use far less carbon than with a granular system to achieve equal or better treatment. And, you won’t have the problems of prefiltration or column plugging common to granular systems. Further, powdered carbon costs less than granular carbon. PACT® systems include retrofits as well as new construction. They range from factory-built units treating 600 to 100,000 gallons a day, to field-erected units treating up to one MGD, to custom-designed systems handling as much as 50 MGD. Both single-stage and two-stage PACT® systems are available in continuous or batch flow configurations. PACT® system customers also benefit from more than 30 years of process knowledge, pilot plant testing capabilities and project design expertise of Siemens Water Solutions.